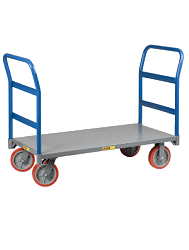 This 3-Position Steel Hand Truck easily Converts to suit your Needs! Convertible hand truck features a 45 degree incline truck position and can be used as a hand truck or platform truck. Continuous curved back handle. 5 position truck Welded 1" O.D., 14 Ga. tubular steel frame. Recessed folding nose (11" W x 29" L). Beveled noseplate (8.5" D x 14" W x .200" Thick). 3.5" urethane swivel casters / 10" pneumatic tires. Bed size 13.75" x 49.50". Shipped KD and boxed.